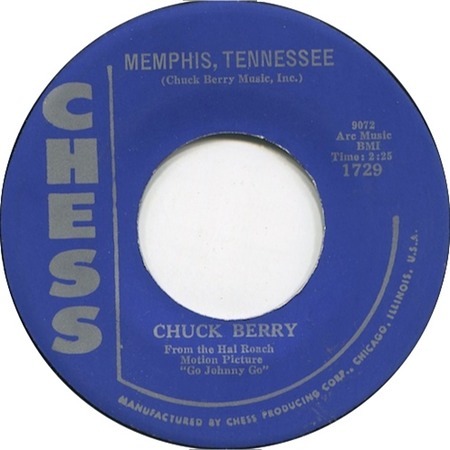 In Chuck's autobiography, he relates how he recorded "Memphis" on a $79 home reel-to-reel tape recorder, working on the number for over a month, starting in July 1958, before taking the tape to Leonard Chess. The list of recording sessions in the book, however, shows 28 September as the recording date, so presumably the track was re-recorded in a more professional setting. There's a story that Elvis had some friends around and played them the acetate of his new recording, "Memphis Tennessee." Presumably he wanted to release it as a single. Unfortunately, one of the guests, Johnny Rivers, liked the number, recorded and released it quickly, and had a number 2 Hot 100 hit with it. Elvis covered numerous Berry numbers — see also Brown Eyed Handsome Man, Johnny B. Goode, Long Live Rock And Roll (School Days), Maybellene; Promised Land, Too Much Monkey Business.